For those of you who have been on the job hunt for a while now, you know that it often feels more draining than the typical stresses of working a full-time job. You put in a great deal of effort with only the hope of it producing a positive result. 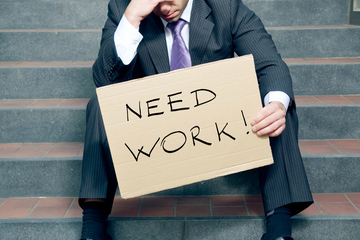 Becoming discouraged is just one of the downsides that job seekers have to endure throughout their job search. Job searching is a full-time job. Searching for a job is anything but quick and easy. The duration of any job hunt is unpredictable. Some may be looking for a few months, others for more than a year. It's always best to start your search immediately, but giving yourself a necessary grace period will not set you too far behind. What matters is the progress and consistency in your search. You can easily overwhelm yourself in a job search similar like anyone working a full-time job can. To avoid succumbing to fatigue, allow yourself a 3-day weekend. When you get back to it, you'll be refreshed and re-energized. Be as efficient as possible with your time by balancing down time with crunch time. Spend time doing something you care about. Volunteer work is work, and is very much encouraged for adding to a resume. Volunteering for a cause that interests you will give you something to look forward to doing every day. It will also get your mind off just sending out resume after resume. There is no shortage of organizations that could use an extra helping hand, especially those that are willing to do it without compensation. Volunteering can benefit your job search in several ways. It not only allows you to network beyond of your typical circles but also provide additional skills and experiences. The time spent volunteering can fill in the gap between jobs. Plus, your experience can pave the way to a new career path. When you revamp your resume, consider applying to jobs within the industry of the organization where you volunteered. Forget the negatives. When all you've gotten for the last few months are rejections or interviews with no job offers, negativity can begin to cloud your mind. After a while, you forget that there are good things to balance that out. For example, say you had a job interview where you and the interviewer really clicked but ended up never hearing from them afterward. This, unfortunately, is an all too common scenario in job hunting. The fact that it's common mean you shouldnt' take it personally. It might sting more knowing that you seemed to have played your cards right in the interview and still no luck, but remember that there are others who would have loved to have the kind of naturual chemistry you did with the interviewer. That alone is something to feel good about. While you may not have gotten the job you were sure was to be yours, build on the positive aspects of that experience for future interviews. It's not fun to think about the reality that you're searching for a job rather than working at the one you already had. The only way to change that is to move forward and find a new one which is easier said than done. The key to achieving any goal is working at it non-stop until you've reached it. This could not be truer for a job search. Job searches require time, patience and above all, positivity. Remember, if you don't believe in yourself, how are you going to convince a hiring manager to?